If you’re a log home owner in Stillwater Oklahoma then your log home is safe with 888-LOG-GUYS! Whether you need to upgrade your existing home, or plan on building a new log home, 888-LOG-GUYS specializes in both. We do log home maintenance, log home restoration, log home repair, log home chinking and sealing, and a variety of other maintenance services. Our log home care specialists are experienced professionals that are ready to take care of your log home and ensure it’s safe, beautiful, and exactly what you want. And we won’t stop until you’re happy! You can trust the refinishing of your log home to 888-LOG-GUYS. As the industry leader in this space, we can offer you several tiers of packages to fit both your needs and your budget. We media blast log homes (we also corn cob blast and glass blast), we strip log homes, offer borate treatments, sanding and grinding, chinking, sealing, and of course staining. 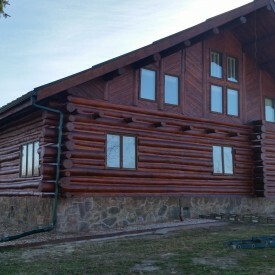 We have restored other log homes in the Stillwater Oklahoma area and would love to speak with you about yours! Maybe we’ve cared for your home in the past, or maybe it is already in great shape. Let 888-LOG-GUYS help you keep it that way with our log home maintenance packages. We service the entire Stillwater area: from Perkins to Ponca City. Let us show you how we can save you time and money by entrusting the care of your log home to 888-LOG-GUYS!